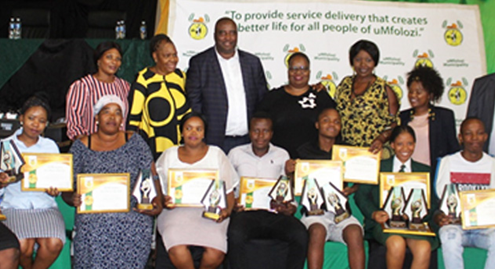 High achieving 2018 matriculants and schools were honoured at the uMfolozi Matric Excellence Awards Ceremony. The awards ceremony was held on Friday, 25 January 2019 at the Municipal Hall. Fifty-five deserving matriculants were awarded registration bursaries to register at any higher tertiary institution of their choice in South Africa. The top 10 matriculants were further awarded laptops, certificates and trophies. The top 10 high performing schools were awarded printers, trophies and certificates for their commitment to producing quality education in uMfolozi. His Worship the Mayor Cllr Smangaliso Mgenge said the Municipality aims to play a positive role in the lives of the people living in uMfolozi. “We need to help learners to change their lives and those of their families for the better through education. By doing that they will be able to come back and make valuable differences within their communities,” said Mayor Mgenge. 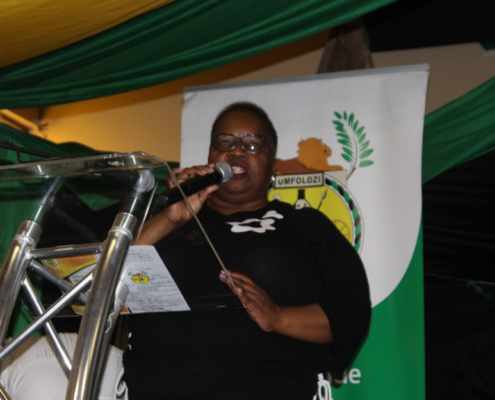 King Cetshwayo District Municipality Mayor Cllr Nonhle Mkhulisi encouraged the learners to focus on their education. Mayor Mkhulisi further emphasised that the awards ceremony is an event to celebrate the good work that was done by the matriculants and schools. Her Worship Mkhulisi urged the learners to remain responsible citizens and to not be distracted as they start their tertiary education journey. The awards ceremony was also attended by Member of Parliament Ms Nocawe Mafu, His Worship the Mayor of uMfolozi Cllr SW Mgenge, uMfolozi Deputy Mayor Cllr SR Thabethe, school principals, circuit managers, teachers, Councillors and NYDA Deputy Chairperson Ms BV Hlongwa. Member of Parliament Ms Nocawe Mafu, His Worship the Mayor of uMfolozi Cllr SW Mgenge, uMfolozi Deputy Mayor Cllr SR Thabethe, Her Worship the Mayor of King Cetshwayo District Cllr NNP Mkhulisi together with the top matric achievers and school principals and teachers. King Cetshwayo District Municipality Mayor Cllr Nonhle Mkhulisi at the Matric Excellence Awards Ceremony.